An electric ratchet makes technical tasks so much easier than they would, wrenching out. While Ingersoll Rand R1120 may not be quite popular among users for one reason or the other, it wins on various fronts, among them durability, convenience, and of course, power. It is a tool worth your time and investment. Let’s see what this ratchet has and what makes it among the best electric ratchet. The company is not what you would refer to as the new boys in power tools making. Instead, they have been around for a long time. Since inception in 1871, the company has been manufacturing and innovating across various technological fields. Their focus on quality is apparent in this wrench. It is without a doubt among the most durable cordless ratchet wrenches, on the market, featuring an all-metal drive train and other components. The ratchet is portable and easy to use that it makes your technical working, smooth. The all-metal components gear train is an excellent source of longevity for this machine. It gives the device the power to deal with various bolts and nuts, effectively. But that is something you feel right from the first moment you purchase this ratchet wrench – quality has a way of selling itself. The motor on this machine seems pretty decent and can stay a long time. If necessary, the wrench is capable of handling additional power when needed. Its attractive and polished aluminum housing asserts itself sufficiently by demonstrating to provide the inside components with sufficient protection. Aluminum is lightweight, as well and that helps keep the whole device lightweight. The device boasts up to 30ft-lbs torque to make your repair works a breeze. Yes, the motor within the device may seem a little small but packs some excellent power. The machine has sufficient power to deal with most of the repair jobs. It is a machine that you can use on a daily basis without a problem. The ratchet is especially useful in the removal of splash guard where the relatively wide head is not an issue. The grip technique features a paddle trigger that makes the business of dealing with nuts and bolts so much easier. It feels like a walk in the park, not some technical work. Being an older version of the electric ratchet, Ingersoll Rand R1120 may not be the most compact tool out there. However, it doesn’t have a problem accessing the small spaces. It has this attractive compact design that you would be proud of displaying on your work desk. Even better, the portable ratchet comes with an internal LED to light your way under the machine or other dark workplaces. That means you will not need to stop whatever you were doing to go and grab a torch. The tool sure wins when it comes to battery power. It makes it portable and comfortable to use on various applications. Specifically, you can toss the device in your toolbox and take it with you wherever you need to work. The charge can last up to a week under moderate use – which isn’t so bad. It uses a patent-pending slim-battery design which improves access in tight spots. However, it does not come with the charger or battery it needs to start working. You will need to purchase them separately. The wrench features a variable speed button which you can use to change the speed depending on the application. The switch is smooth to use and makes your tasks so much easier. Unlike some of its competitors on the market, this machine does not offer too much power to deal with the very stuck bolts and nuts. Rust and corrosion can make a nut or bolt quite stubborn, and without the necessary torque, the machine would be useless. However, you can manually add some more torque. The battery capacity diminishes with the passage of time. As it gets old, you will note that it does not last like it used to but that may be a common problem among battery-powered equipment. The power in these batteries is also a bit low compared with other equipment. The R1120 is a bit wide, compared to its peers. Considering this fact, the machine is relatively expensive. Some tasks such as splash guard removal and dealing with bolts and nuts can take a lot of your time, as well as the joy. But why should you struggle to do one task while you can always get a power tool? 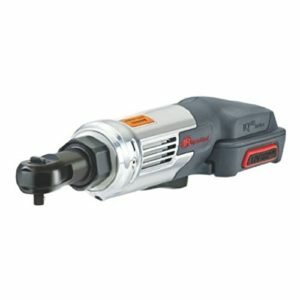 Ingersoll Rand R1120 is an efficient ratchet that you can consider a gem in any toolbox. It is quite durable and comes with an LED light to illuminate the bolts that think they are hiding well in the dark. But unlike some of the other ratchets on the market, this machine is a little heavy and may weigh on you significantly if you are not a brawny person.